Ford's 100 years in photos 8/52 | What Car? 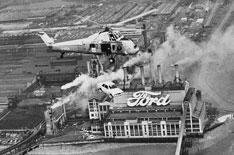 This week we see how Ford celebrated building the millionth Cortina in 1970, by strapping it to a helicopter and flying it over the Dagenham factory were it was built. According to Ford, it then took the helicopter two hours to fly the two-door 1600E MkII to its new owner in Ostend, Belgium. Introduced in the 1960s, 4.3 million Cortinas were built over its two-decade production run. It was the best-selling car in Britain for 10 years of this lifespan - in 1967, 1972, 1973, 1974, 1975, 1977, 1978, 1979, 1980 and 1981 and second place in eight years and third in just two. Click here to see last week's picture of Mikko Hirvonen at the wheel of a Model T.